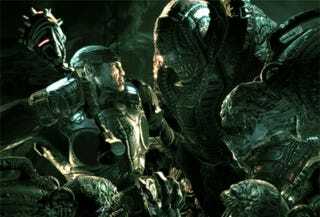 Wyck Godfrey, producer of the Gears of War movie adaptation, has thoughts about the transition of the Xbox 360 game's transition to the big screen. These are those thoughts. "The hard part is to make [Gears of War] into something that doesn't feel like a world torn asunder and people just in battle," Godfrey tells Making Of. "I think we really want to focus on the idea of a world that's running well and then it's Emergence Day." Godfrey says he pictures the film—to be directed by Underworld director and Kate Beckinsale husband Len Wiseman—telling a story of the survival of "those 48 hours" following Emergence Day, likening the experience to 2008's big monster movie Cloverfield. He also says this. Help me decipher it. "Trying to tell the epic story of an alien planet that's living in a horrific environment just feels like the wrong move right now," Godfrey tells Making Of. If that means something to you, please, let us know your interpretation in the comments.